Experience the magic: explore the interactive Book of Change. Give the gift of magic to those you love. Make your holiday season a special time positive change. The Chinese I Ching is the ultimate, time-tested decision-making tool. It is particularly relevant to the modern world because it presents timeless wisdom in a neutral form. Those who have become disenchanted with sexist, authoritarian and culture-bound sources of guidance find that The Common Sense Book of Change offers them a viable alternative method for getting in touch with the authority of inner conscience. The Introduction to this version of The Book of Change includes clear, easy-to-read instructions. Accessible to anyone with basic English skills and an open mind, the text gives a direct, hands-on experience of the wisdom tradition honored by truth seekers and leaders in every walk of life for thousands of years. Following Jung’s example, it asks, “What does The Common Sense Book of Change have to offer its readers?” The result is AWARENESS. One changing line leads to GAIN. Because comparisons develop an appreciation for the universal idea, deeper than words, which underlies individual modes of expression, a section introduces “Other Versions,” quoting from complimentary comments on AWARENESS. ** For sample content see the CSBOC page above. Available on Amazon.com. Two Sides of a Coin: Lao Tze’s Common Sense Way of Change evolved as a companion to the I Ching. Few realize that this universally loved mystical, poetic book is seeped in I Ching science and philosophy. So too, those unfamiliar with the Yoga Sutras don’t appreciate how closely the Tao Te Ching resembles yogic wisdom. Two Sides was produced to connect these dots. Thus, according to the enduring philosophy and science of change, true fundamentalists and radicals (both words originally meant the same thing) are not those who meddle with events on the Life Wheel’s material surface, but individuals with the courage and vision to change themselves from the inside out. From that inner change, all outer changes follow. “Survival” is a primal word. It means to LIVE, the alternative being extinction. Survival is the bottom line. In a life or death situation, the natural instinct is to survive at the cost of everything else. The basics must be secured first. If you’re dead, thriving isn’t an option. However, the focus of Rethinking Survival isn’t on “how to” survive. Here, survival implies that there’s more than martial arts skills, back woods know-how and environmental smarts to staying alive. It requires self-knowledge and a connection to one’s deepest roots of origin, as well as a powerful, clearly defined and positive purpose for living. It also requires an educated sense of timing: an acute awareness of alternating cycles — natural pendulum swings between extremes of expansion and contraction — along with the will and patience to ride them out. Programmed assumptions too often drive our decisions, actions and ultimately, survival options. Even with the best of intentions, misinformed people operating on conflicting beliefs destroy themselves and others. Sometimes the process is quick. Suicide. Murder. Usually it’s slower — atrophy and self-sabotage. The connection between skewed thinking and disastrous results is mirrored in the global disconnect between policy and practice. Knowledge deficits are directly responsible for bankrupt economies, personal and international alike. In the United States, politicians of both parties use psychological scare tactics to polarize the public. They warn with phony threats, at the same time, putting all of us at risk. Like Nero who fiddled while Rome burned, leaders alienate us with disgraceful partisan bickering. At the same time, they avoid the real dangers which threaten to burst the bubble of illusory progress with excruciating finality. Along with an equally culpable media, misinformed leaders are placing us in grave peril. Shifting to a complete and accurate paradigm while there’s still precious time is the best hope of survival.
. . . a new, inclusive reality map, one people worldwide can easily comprehend and agree upon. It is equally compatible with scriptures and science, bridging the gap between them. 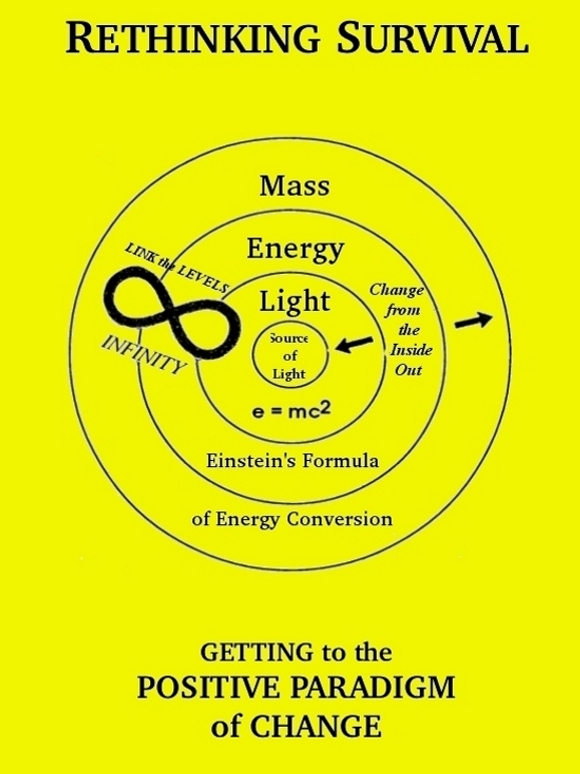 It fulfills Einstein’s intuited search for the Unified Field Theory, picturing how all parts of creation are related, interwoven and interdependent. The Unified Theory of fellow violinist Einstein’s heart’s desire. Ironically, without yoga background, he had no idea of what he’d received. The Life Wheel with its concentric circles, the levels of manifestation joined in an infinite loop, is equally compatible with the perennial philosophy shared in common by the world’s enduring wisdom traditions and with modern physics. This universal reality “road map” answers comparative religion legend Joseph Campbell’s call for a creation story which recognizes the humanity of everyone, everywhere. It is a profoundly simple yet complete and correct model upon which scientists and sages can agree. ** See the drop-down menu of the RS page above. Conscience: Your Ultimate Personal Survival Guide was written to link the I Ching and its next generation spin- off — the Positive Paradigm of Change — with calculus, the binary digital code of computer science, yoga anatomy, DNA and the modern medical tradition. From the back cover: “The dynamic law of change occupies the middle level of the Positive Paradigm Wheel. The Book of Change which codifies Natural Law belongs to this domain. It’s the missing link in our knowledge banks, lacking which things go terribly wrong, even with the best of intentions. The title came from brain-storming with a business consultant. She had no idea what the I Ching was about. She asked me to tell her. When I described the many benefits of working with The Book of Change, she was impressed. As if a light bulb clicked on in her brain, she exclaimed, “It sounds like the ultimate personal survival guide!” She was exactly right. Shirley came to the book with the usual set of assumptions and prejudices. So in addition to describing its little known origins in math and science, I included a Q & A section to dispel common myths and misconceptions. Many confusions also stem from careless language use . . . what I’ve come to call The Tower of Babel Dilemma. People use the same words to mean different things. They miss each other coming and going, not recognizing the disconnect. So I also included 64 Essays on each of 64 value terms from Action to Virtue. They serve as examples of how we all can use the I Ching to clarify our thinking. ** See drop-down menu of UPSG page above. Dysfunctional paradigms tie us in knots. They tear us apart. They drive us crazy. They push us (first individually, then collectively) to murder and even suicide. To survive intact, we must cleave to the essence of the perennial philosophy. The universal Life Wheel (Positive Paradigm of Change) is a snapshot of the essential truth which the world’s great religions share in common. It offers us a way out of global madness. It gives us a means for restoring sanity to our world outlook. It is a question of which worldview will prevail. Everyone must choose. (Failing to choose consciously is also a choice.) Do we cling to dysfunctional paradigms that have brought us to the brink of Titanic disaster? Or do we opt for Einstein’s new way of thinking? Do we choose to be, or not to be? To survive or perish from the face of the earth, that is the question. In Positive Paradigm context, peace necessarily begins one individual at a time, and is accomplished from the inside out. So long as dysfunctional paradigms put individuals at war with themselves, general ignorance will continue to escalate into worldwide conflict. The autobiographical section of Rethinking Survival: Getting to the Positive Paradigm of Change details how I began drawing concentric circles long before attaching much significance to them. And how they gradually grew on me. And grew. In the end, I recognized that the Life Wheel can be turned into an elegantly simple analytical tool. I can compare my own life as a perfect snow flake, one small atom in a large universe to see whether I am whole. Or if I’ve gotten bent out of shape. Whether all the layers are there, in balance and harmony. Or what needs work to bring my life back into alignment with the original pattern of life. The Handbook is the practical sum and extension of all earlier work. It operates on the same basic philosophy and works for all the same reasons the Book of Change does. It begins with the premise that qualitative change necessarily begins one person at a time, and from the inside out. Yet, while cut from the same fabric, there important differences. It is a fresh approach, free of cultural baggage. It is also easier to work with, especially for today’s left-brain dominant thinkers. In it, I offer to others the same hands-on METHOD of integrated self-analysis and decision-making that works for me. This method is based on seven basic axioms derived from the Book of Change along with their corollaries. These basic rules form the groundwork of effective decision-making about relationships on all levels, from the smallest personal scale to increasingly larger units of governance. Today, the Handbook offers change agents in every walk of life a practical way to achieve the positive, long-lasting change which all of us want, many promise, but only few can deliver. Areas of immediately practical applications for creating positive change include but are not limited to: personal growth, organizational leadership, and policy making. ** See the drop-down menu of Handbook page above. Use the Donate page to pay for value received. Thank you. I love this balance among the “four wisdoms.” It is a rich digging and well worth the time. This transcends the modern problem of too much “niche” thinking as opposed to considering a completeness of thought and habit of being. It’s easy for someone to blithely say, “You think too much.” It is far more rewarding to take a true mindwalk through all beauty left by humankind, not just western culture. I look forward to getting a book this week! Catherine, your comments are welcome and most perceptive. It’s almost as if you took a quote directly from the forthcoming Handbook: “In a world seemingly intent on fracturing experience into smaller and smaller niches, the Positive Paradigm provides an urgently needed counter-balance, applying opposite and equal weight in a unifying direction.” All best to you! I discovered you and your work this morning via linked in. Thank you, for you. We are on the same path, the road that indeed leads to a possible future of inner peace, to world peace. My thanks to you as well, Daniela. In response to your comment, I just reposted Rethinking PEACE (posted here last March) on LinkedIn. With kindest regards, All best!